The ruling Saenuri Party on Sunday wrapped up its candidate nomination for the imminent April general elections by confirming the candidates for its traditional stronghold areas, including the Gangnam constituencies in Seoul. The corresponding announcements were expected to come earlier but have been repeatedly delayed amid the right-wing party’s swaying strategy over the areas. “The party has confirmed the candidates in 223 out of 246 constituencies,” said nomination panel chairman Chung Hong-won. 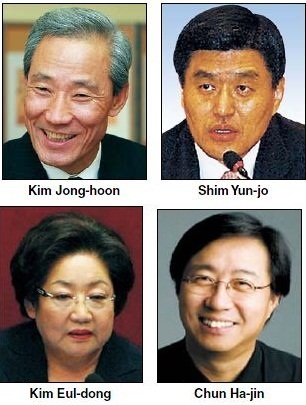 Former assistant vice foreign minister Shim Yun-jo was nominated in the neighboring Gangnam-A and Kim Jong-hoon, former chief negotiator for the Korea-U.S. Free Trade Agreement, in the Gangnam-B constituency. The two thus respectively replaced Park Sang-il and Lee Young-jo who were recently disqualified for their controversial remarks over Korean history. Proportional representative Rep. Kim Eul-dong safely won her candidacy in Songpa-C and former Hancom CEO Chun Ha-jin in Bundang-B, another right-wing stronghold in Gyeonggi Province. However, most incumbent Gangnam representatives such as Reps. Lee Hye-hoon, Koh Seung-duk and Lee Jong-koo were ruled out of the list. Koh is the lawmaker who ignited the scandal over party vote-buying by saying that he was offered a cash envelope by a former aide to former party leader and parliamentary speaker Park Hee-tae. The party, while excluding many of its current members, decided not to make nominations in eight constituencies, including Gwanak-A and Seongbuk-A, according to Chung. The corresponding areas are the constituencies of Reps. Kim Song-sik and Jeong Tae-keun, who defected from the party last year, calling for genuine conservative reforms. The decision thus called for speculations that the party may be inducing the two lawmakers to retrieve their former party membership, especially after winning their race. The major candidate reshuffling in the Gangnam belt ― referring to the Gangnam, Seocho and Songpa districts ― was unprecedented as the area has always been considered a firm stronghold for the conservative party. However, the ruling party’s reputation has faltered recently, even in such areas, due to the party’s internal feuds over the nomination. Since the party kicked off its candidate screening, several figures have expressed strong opposition or even defected from the party. The responses were especially harsh from pro-Lee Myung-bak figures who claimed to have been excluded from the nomination. Also, the main opposition Democratic United Party vowed to win over Gangnam through a fierce battle by allocating its top public figures there. Former Democratic Party chairman Rep. Chung Dong-young will be running in Gangnam-B against the former FTA chief Kim. Former party floor spokesperson Rep. Chun Hyun-heui was allocated to the Songpa-A constituency and former Justice Minister Chun Jung-bae to Songpa-B. The aggressive nomination of the left-wing party thus led to concerns that the right-wing may no longer guarantee its victory in the affluent neighborhood.